Not even 13 miles, 12.8 miles to be exact --that’s how long Route 66 is in Kansas. Despite its short length, the route passes through three towns that are rich in cowtown, mining, and route 66 history -- Galena, Riverton, and Baxter Springs. In Baxter Springs, motorists will find a bold example of its Route 66 history in the Independent Oil and Gas Service Station. The stock market crash of 1928 and the Great Depression that followed left major oil companies in disarray. Some companies failed, and others were bought out. The survivors struggled to attract and hold customers in order to rebuild their damaged brands. In a savvy public relations move, oil companies began establishing uniform station designs that immediately identified their brand to car-driving customers. For good reason, many of these new station designs had a distinctly domestic flair. The homey, cottages designs sought to appease local customers by blending into the surrounding neighborhood and provided travelers with a sense of security and comfort during an economic era fraught with uncertainty and discomfort. 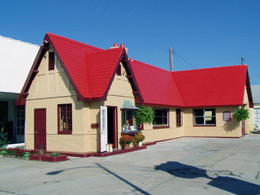 Baxter Springs has a prime example of just such an “automotive cottage.” Small and square when it was built in 1930 at the north end of the Baxter Springs commercial district, the station featured brick and stucco walls, a pitched roof, a chimney, and shuttered windows. A small copper-roofed bay window was located next to the entrance, and Tudor Revival influence was apparent in the cross-timbered gables and deep eaves. In 1940, the building was enlarged without seriously disrupting the building’s original plan, form, and materials. A tall, shield-shaped Phillips 66 pole sign still stands at the southwest corner of the property. The station’s design clearly conveys its original use as an early service station as well as the intentional “welcome home” iconography of its owners--first Independent Oil and Gas and later Phillips Petroleum. Citizens of Baxter Springs have had a strong interest in local history and preservation for a long time. In 1980, the Baxter Springs Heritage Society opened a museum. The society became interested in the gas station, which had stopped selling gasoline and been used as a gift store, dog-groomer’s shop, and chiropractor’s office. In 2003, the National Park Service listed the station in the National Register of Historic Places, and the heritage society acquired it the same year. Grants from the National Park Service Route 66 Corridor Preservation Program and the Kansas Humanities Council and local volunteer labor and in-kind contributions assisted with the repairs and cleaning needed in order to reopen the building as the Kansas Route 66 Visitor Center. The center had its grand opening in 2007. 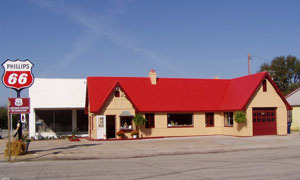 Occupying a corner lot, the building continues to communicate its 40-year association with Route 66 and to offer services to the travelers of today. The Baxter Springs Independent Oil and Gas Service Station building is at 940 Military Ave. in Baxter Springs, KS. The building now houses the Route 66 Visitor’s Center, which is open to the public Monday-Saturday, 10:00am to 5:00pm. Call 620-856-2066 for information or visit the Baxter Springs Heritage Center and Museum website. The National Register nomination form for the building can be found here. More information about the Route 66 Corridor Preservation Program can be found here.